Home > Products > ChargeIt by Jay Circus Gold Border Glass Charger Plate 13"
Perfect for fine dining establishments, the ChargeIt by Jay Circus Gold Border Glass Charger Plate 12.5" adds a contemporary and modern touch to any table setting. 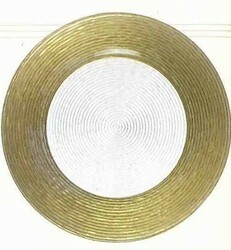 Beautifully accented with mesmerizing rings in glamorous gold, this charger plate will surely impress guests. Thanks to its solid glass construction, this premium quality charger plate adds an upscale look while providing unparalleled durability and product life. This charger plate is large enough to accommodate any size plate.